The weather is starting to feel like spring time here in Charleston. Our temperatures have been climbing into the 80s. 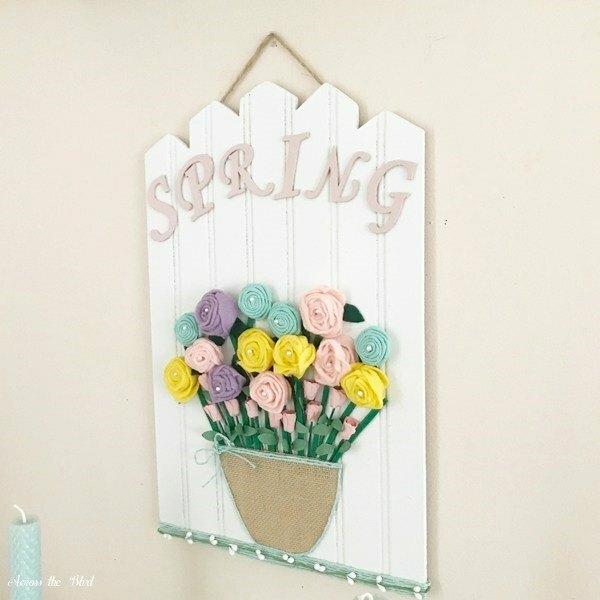 It’s time to put away all of the wintry decor and bold colors and bring out the pastels and pretty pops of cheerful spring time colors. 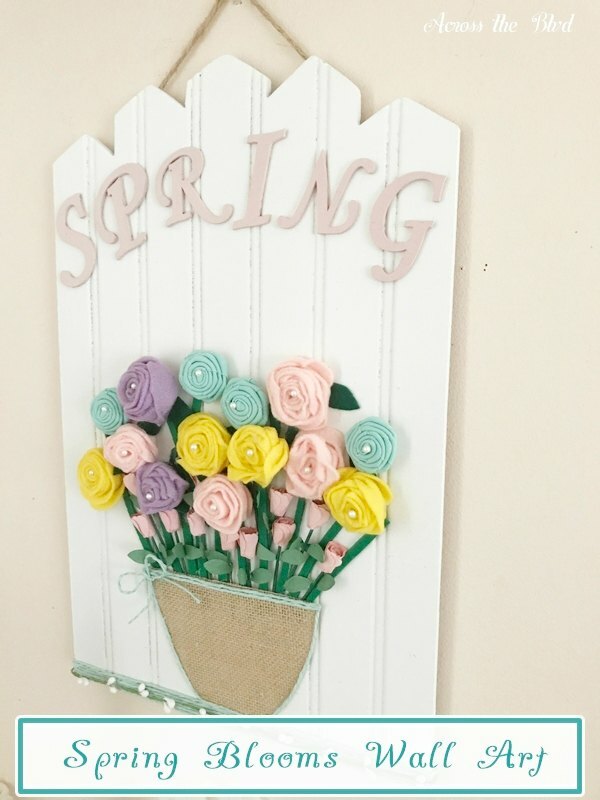 This Spring Blooms Wall Art is a great way to welcome in the new season. I found this Art Minds bead board plaque at my local Goodwill. I’m not sure what the price of this would be at a craft store, but I got it for $2.99. It was in great condition and didn’t need to be repainted. That’s always a plus! I have a supply of wood letter that I like to use for various projects. 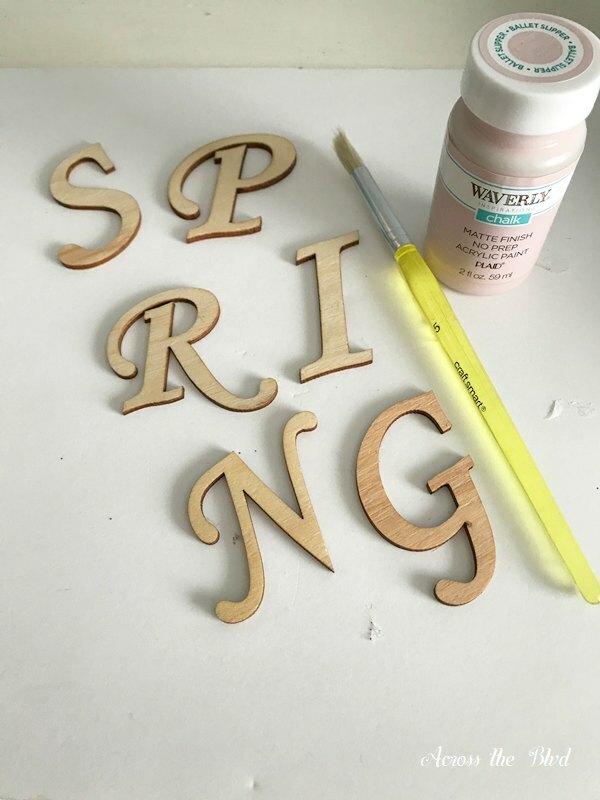 I pulled out the letter for Spring and gave them a couple of coats of Ballet Slipper Waverly Acrylic Paint. 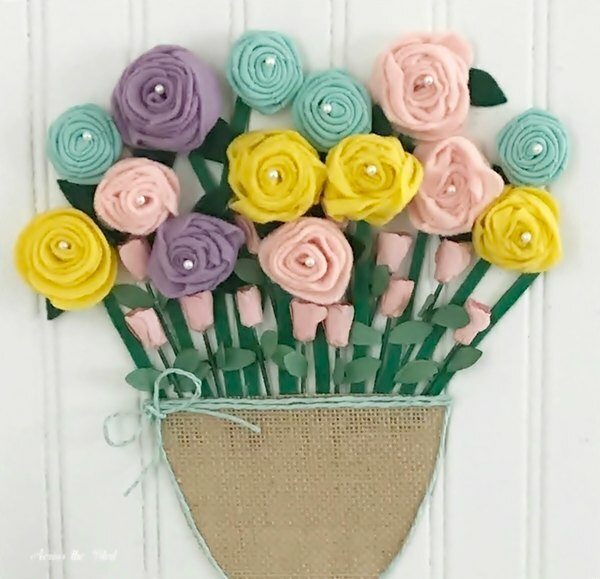 Making felt flowers is a go to craft for easy embellishments for me. I made an assortment of them in various colors and sizes. I purchased the package of pink roses to use for Valentine’s Day, but I didn’t need them. They worked nicely for this project. 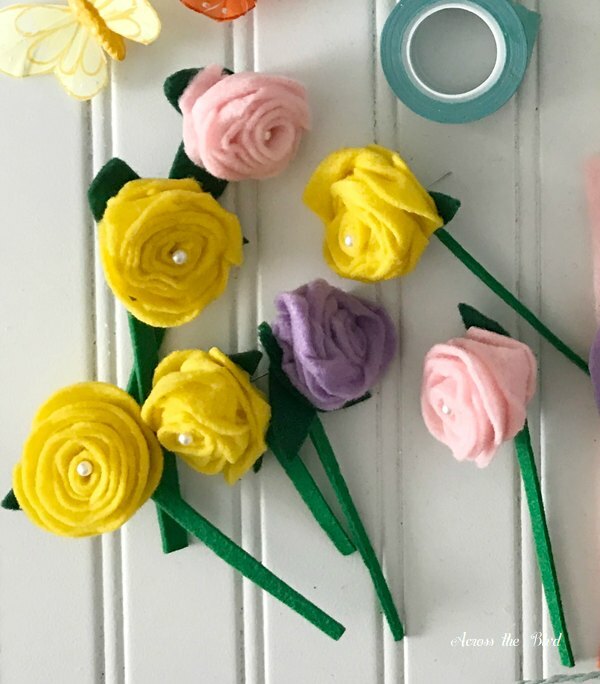 There are a few different ways to make felt flowers. I use a roll method. For some of the flowers, I didn’t use the spiral strip. I used a straight strip of felt. 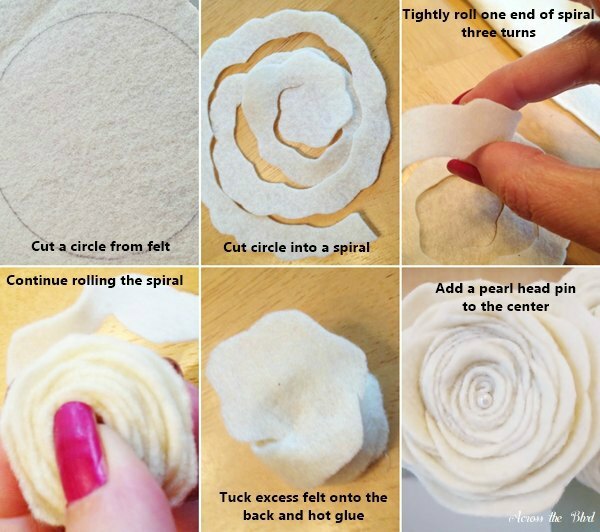 When rolling those, you will need to twist the felt back and forth as you roll it into a flower shape. You know how as crafters we save almost everything? When I cut the top from the leprechaun hat centerpiece that I made for St. Patrick’s Day, I was left with a round piece of sturdy felt. Of course I didn’t toss it! I found a use for it sooner than I thought I would. I cut it into strips and used it for the flower stems. Using hot glue, I added the paper rope to the bottom of the board. It’s wrapped around the sides and a dot of glue is added to the back of the board. I find so many uses for laminated burlap sheets. I love that they don’t ravel when cut. I cut small piece in the shape of a pot. More of the paper rope is added around the rim of the pot. I glued the bead garland on top of the paper rope to add more dimension to the bottom. The stems are hot glued onto the board and then the flower pot is glued in place. 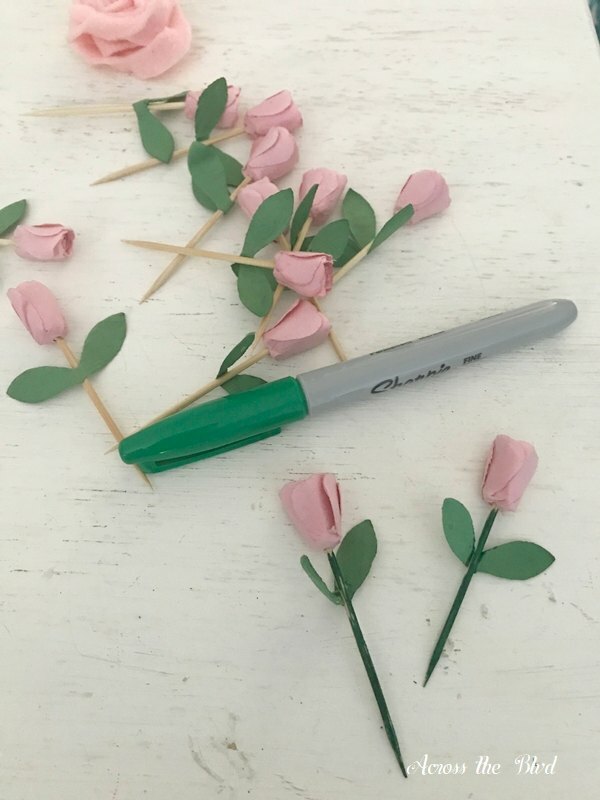 I love how delicate these paper roses are, but I didn’t love the wood colored picks. To have them blend in better, I used a green marker to color the picks. 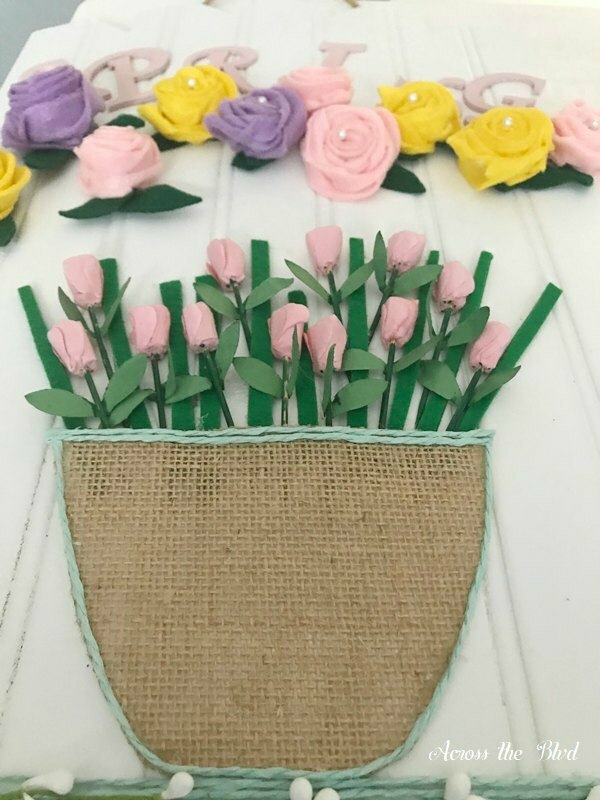 The roses are tucked between the flower stems with a tiny dot of hot glue to keep them in place. The felt flowers are each hot glued to the board, matching up with a stem. 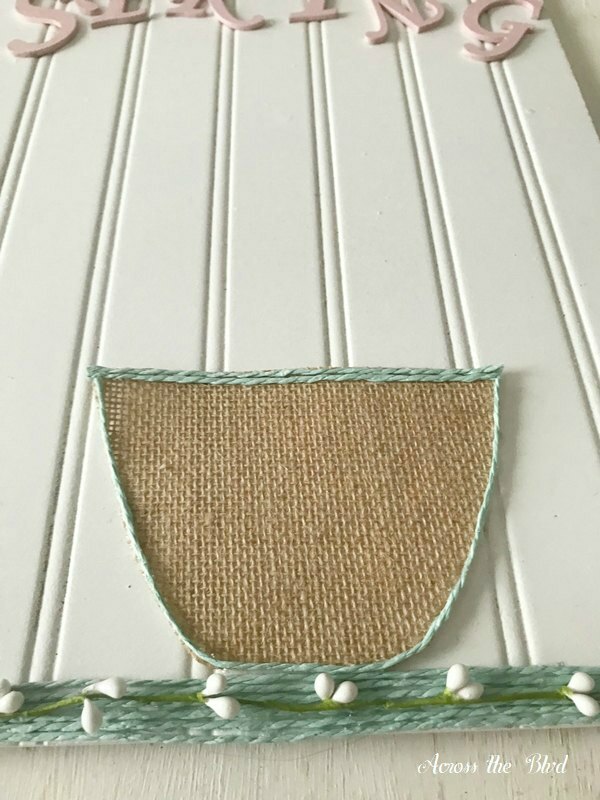 The finishing touch was to add a bow tied from the paper rope to the corner of the flower pot. It’s glued in place. I love how cheerful this turned out to be! It adds a touch of spring to my sun room. The only time consuming part of putting this together was making the flowers, but once you have the hang of it, it doesn’t take long to make a lot of them. 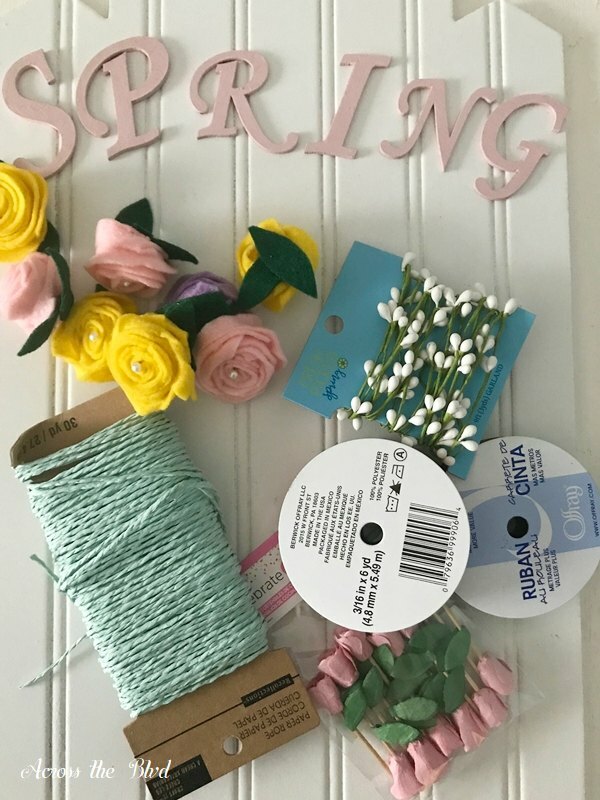 Are you breaking out your spring decor yet? I might be rushing it just a bit since it’s only the start of March, but it’s a welcomed change. Thank you, Dee! How kind of you to say! Thanks for sharing. I appreciate it! Thanks, Michele! I appreciate the pin and the share! This is one of prettiest and most clever decorations have seen so far this March. I just had to print it out so I could make attempt to make something like it anyway, hopefully. Won’t have the plaque behind it but will come up with something. Haven’t seen this at Michaels but will look for it soon. Or have Mr.Furry,make something for me. Just love this, is so perfect and happy for new spring. How kind! Thank you, JaneEllen! I love knowing that I’ve inspired you to make your own. I hope you enjoy making yours! Whatan adorable sign! I love it! Thank you for sharing on Merry Monday! Hope to see ya next week! Thanks, Kim! I always enjoy linking up at Merry Monday. 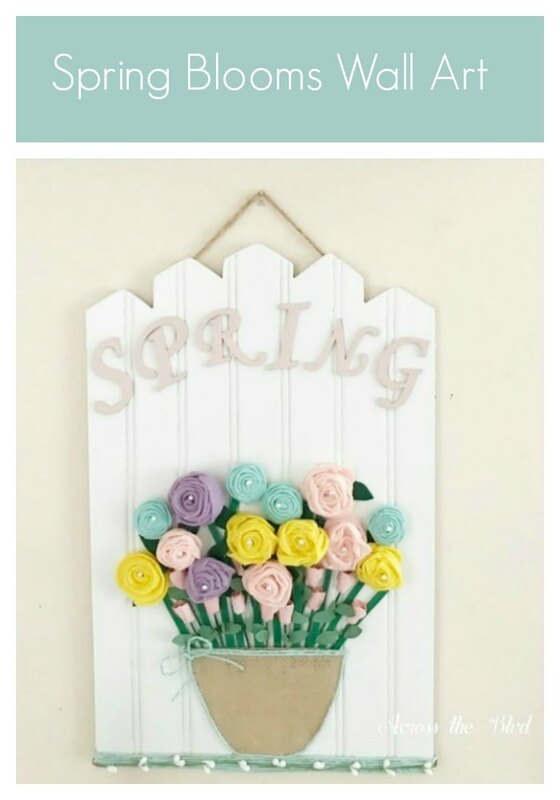 The little spring sign is wonderful, I am trying to come up with something similar for my back yard fence. It was a fun and simple project to put together. 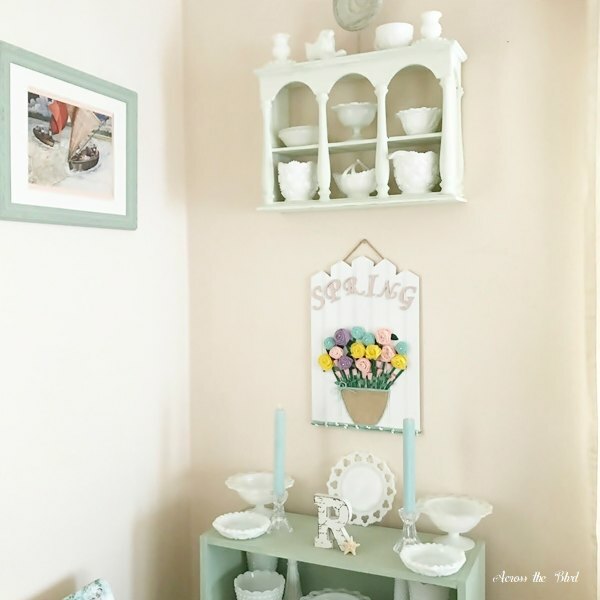 I love milk glass. My collection of it has been growing over the years and I’m always on the lookout for unique pieces. Thank you! 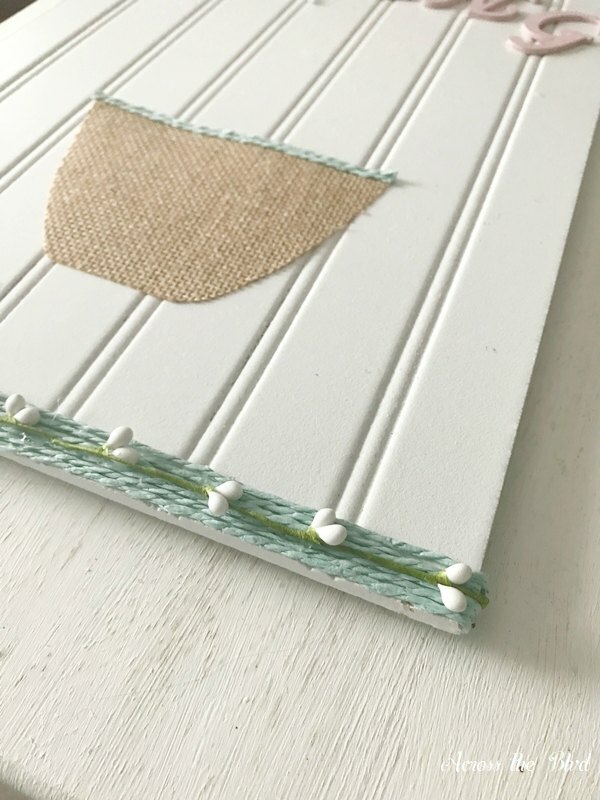 The beadboard was quite a find and you turned it into something beautiful. Thank you for sharing with us this week at Celebrate Your Story and we hope you will join us again next week. 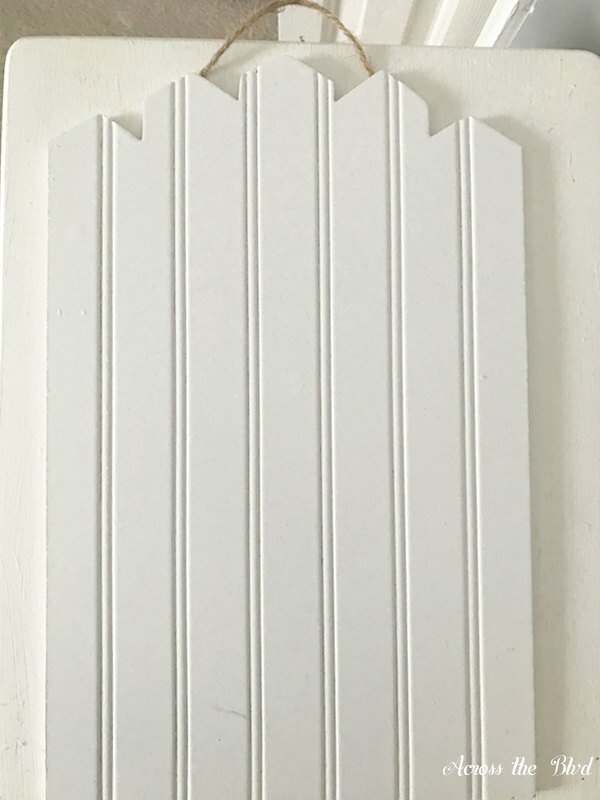 I was happy to have found the beadboard for such a good price. Thank you, Sandra and thanks for hosting each week. So very pretty! I definitely pinned it for inspiration. Visiting from the Wonderful Wednesday Blog Hop. Thank you, Donna. I appreciate the pin! 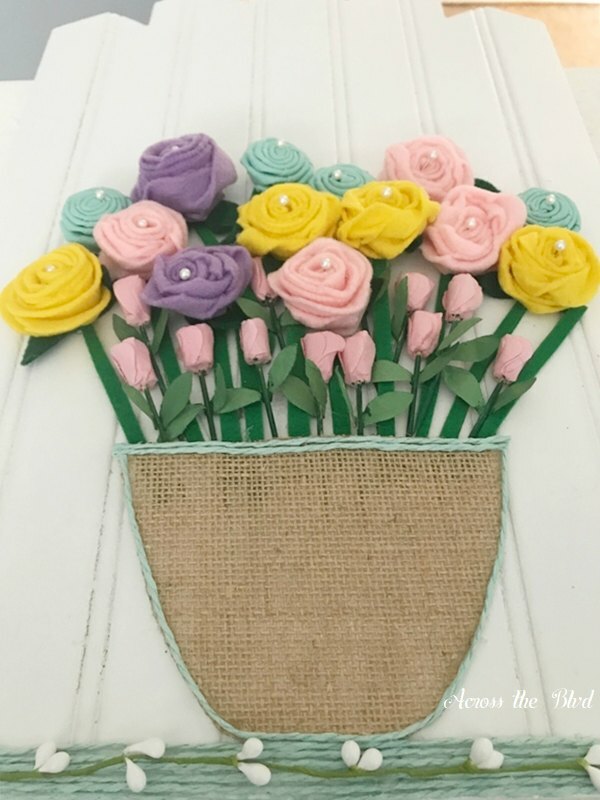 Beverly, I love the felt flowers along with those soft roses! So pretty and colorful for spring! 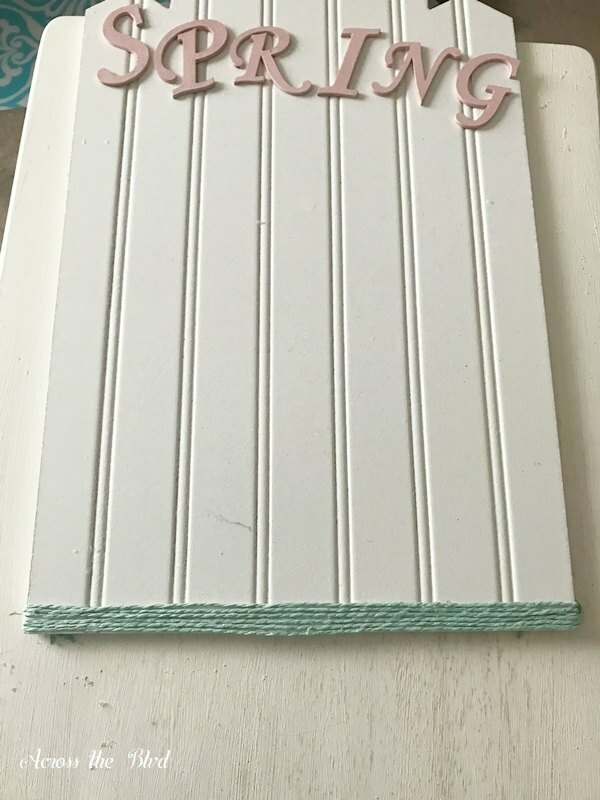 another great find with the beadboard sign – makes a great backdrop for this project! Pinning and sharing! Thank you! The beadboard sign was great to find at Goodwill. I was glad I had those little roses on hand. They filled in the gaps between the felt flowers nicely. Thank you for sharing, Laurie! I appreciate it! Thanks so much, Laura! We’re delighted that you like it. We appreciate the feature! This looks so pretty on your wall. You did an excellent job! Thank you for sharing on Party in your pj’s. Pinned! Thanks, Teresa! I’m enjoying it. Thanks for hosting and for pinning! Thanks so much, Marie! I’m ready to bring this out for this year. I guess I should hold off until at least March though. I appreciate the pin! This is so bright and cheerful for spring. 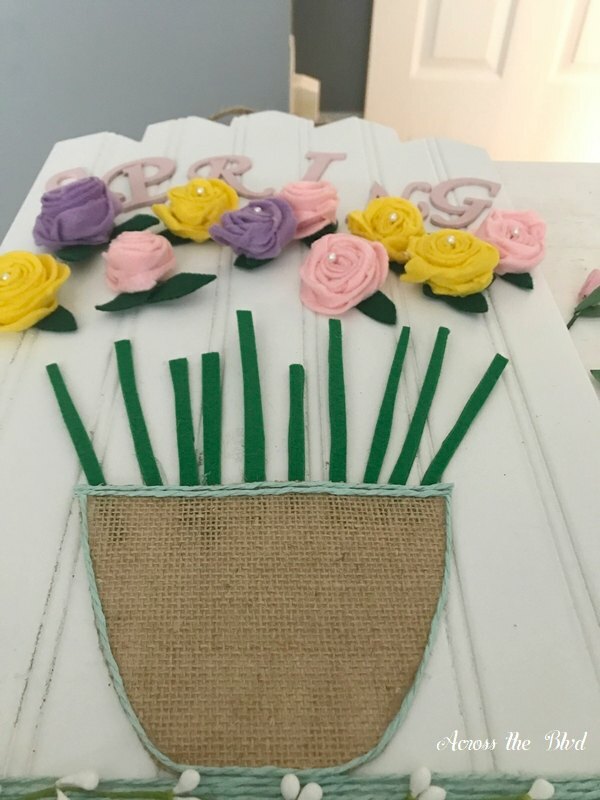 The handmade flowers add the perfect touch. I love this! Pinning. Thank you, Leanna. Those flowers are such an easy go to addition for lots of items. I appreciate the pin!